"My major fear was constantly that my parents wouldn't make it. I expressed guilt that I was free, and that's why I was suffering so much." The facts are simple, and mostly well-known: after Hitler came to power in Germany in 1933, Jews were increasingly targeted and victimized as part of Hitler's efforts to create the perfect Aryan race. Over the years, the persecution become worse, and Jews were stripped of citizenship, forced to abandon their homes and businesses, sent to concentration camps, and murdered by the millions. Out of all of the horror that the Third Reich engendered, there were a few bright spots, and one of these is the story of the Kindertransports ("children's transportation"). Despite the fact that some Jews were able to obtain export visas, they weren't allowed to take any money out of the country, so most nations were unwilling to take them. However, after Kristallnacht, Great Britain opened its doors and allowed nearly ten thousand children to immigrate from Germany, Austria, Czechoslovakia, and Poland (a similar bill in the U.S. died in committee). Social organizations soon made arrangements for their transportation. Documentary filmmaker Melissa Hacker knows the subject well, not the least because her mother, Ruth Morley, was one of the lucky ones, and it's this subject that she chooses to explore in My Knees Were Jumping: Remembering the Kindertransports. It's an interesting and affecting documentary, which not only deals in historical facts, but weaves together personal accounts and archival material to create a striking tale of the children and their circumstances. The majority of them were taken to Great Britain by train, and ironically thought of their journey as a grand adventure, assuming that they would soon be rejoined with their parents�although 90% would never see them again. Once in Great Britain, they were sent to summer camps. From there, some were lucky enough to find permanent placement in homes, while others revolved from family to family, and yet others were sent to farms or hostels. Many of the children adjusted quickly to their new circumstances, while others were not so lucky. But it's not just the children's stories that Hacker is interested in. She also examines how these childhood experiences have affected the lives of the now-adult survivors, and the common thread is a sort of over-protectiveness of their children, hardly surprising given the circumstances. And their children, in turn, seem to have been psychologically marked by the history of their parents. Hacker uses a variety of source materials, such as archival still photos and movie footage, period newsreels, correspondence between the children and their parents, contemporary interviews, and excerpts from speeches at the first North American conference of the KinderTransport Association. Skillfully interweaving past and present, historical fact and vivid recreation of personal experiences, Hacker creates an indelible and poignant portrait of the Kindertransports. Image Transfer Review: The image is variable. Some of the interview footage is grainy and shows compression artifacts, but others are much better, with bright and reasonably-accurate colors. Much of the source material is archival in nature and of lesser quality, but the transfers of this black-and-white material are fine. Audio Transfer Review: The sound is fine�dialogue is always clear, and the music comes through reasonably well. There is zero activity in the surrounds, and the sound is closer to mono than stereo. It's a documentary, so don't expect a sonic spectacular, and you won't be disappointed. Extras Review: There's an interesting text biography of filmmaker Melissa Hacker, but the primary bonus here is an interesting interactive catalog of other Docurama releases. Each of the 51 films listed is given its own screen, and each screen shows the DVD case and briefly describes the film. Thirteen of those screens include trailers, which are mostly full frame, and are all in very good to excellent shape. 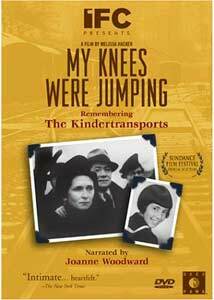 In My Knees Were Jumping: Remembering the Kindertransports, filmmaker Melissa Hacker tells the story of children who escaped the horrors of Nazi Germany and found refuge in Great Britain. The transfer is variable, but never distracts from this powerful and poignant documentary.